In 2016 we started meeting every 2 months instead of every month. We began meeting at the New Lynn Community Centre and then shifted to the New Lynn MacDonalds meeting room. A major focus of this year's activities has been the housing crisis, and secondly, suporting the campaign to stop sanctioning single mothers who don't name the fathers of their children. We also made efforts to liase with other community groups and with Unite Headquarters. People's desperate poverty continues unabated, with the $25 increase in Sole Parent Support, being way too little , too late. The most obvious sign of a failing system has been the housing crisis, which is now so bad that the Government can no longer deny it, and has been caught on the back foot, with no solutions in sight. Despite the desperate shortage of affordable housing, the Government continues to sell off our publically owned state houses into private hands.. Only a fraction of them end up as "social housing" which is a privately owned rental accommodation with government subsidies to be rented out more cheaply than at market rates. In 13 February and on 9 April I represented Unite Waitemata, and West Auckland SHAN at SHAN planning meetings for a New Zealand Housing Summit. The Housing Summit was held on the 16th April. I attended this summit along with several other members of our branch . 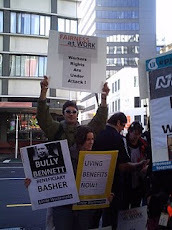 In June, I organised a protest outside a public meeting, on 13 June, held by the National Party in Blockhouse Bay, where the speakers were Paula Bennett, Minister for Social Housing, Nick Smith, the Minister of Housing. 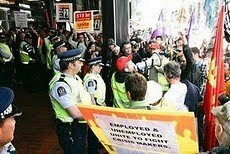 This was a well attended and lively protest, with a large contingent from the Tamaki Housing group, amongst others. 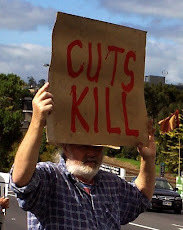 Later in the year our members attended other housing protests, such as a symbolic occupation outside some empty state houses in Glen Innes, and I attended a protest at public event about a house which had been built in a programme called "The Block" . n August, the Tauranga branch of SHAN formed a separate group, an incorporated Society entitled SHA Inc, in order to take the government to court for selling state housing in Tauranga. Whilst we expressed our support, we didn't join the new incorporated society. The government has not introduced major new legislation this year that directly attacks benefits, but it has attacked beneficiaries indirectly. The Social Security Rewrite Bill reinforced or even worsened some of its earlier oppressive legislation, including rewriting Section 70 which punishes women for not naming the fathers of their children. We took part in the campaign to the "Stop the Sanctions" against these women. I gave an oral presentation of the submission to the Parliamentary Select Committee. On 15 September Keith and I attended the AAAP's official launch of their campaign to "Stop the Sanctions"; which appears to be getting widespread support amongst MP's of several political parties. This campaign was supported by several groups including the Auckland Women's Centre and the Child Poverty Action Group. The new MInister for Social Welfare, Anne Tolley, has introduced legislation that reforms CYF. It opens the way for more social work to be done by private agencies , and makes it easier for Māori and other children in care, to be fostered by families that are not of the same extended whanau , hapu, or iwi. Many Māori are very concerned about this, and see it as a colonial attack upon their people. The United Nations has criticised the English name of Anne Tolley's new ministry, "The Ministry for Vulnerable Children" as stigmatising the children it focuses on. I continue to do media work, including maintaining our two facebook pages. 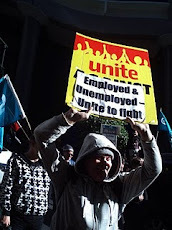 the Unite Waitemata Like page, and the Waitemata Unite group page, and helping to take care of the SHAN facebook page. 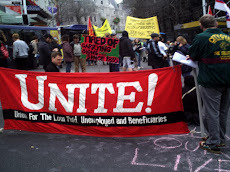 This year some of our members, together with our Unite Waitemata Banner; have attended protests in support of the Syrian revolution, and against the aerial bombing of civilians. We have maintained a co-operative relationship with the Combined Beneficiaries Union, with some of us attending their meetings, and with Thomas Harvey, from the CBU attending our June meeting. We continue to support Auckland Action Against Poverty , and other groups campaigning against poverty. In April I assisted at the AAAP Impact, held at Mangere WINZ. And of course we support SHAN, the Tamaki Housing Group, and other housing activist groups. 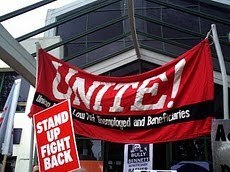 The visit of Mike Treen, Unite director, to our August meeting, at the invitation of our President, Christina Faumuina, was a positive step, and hopefully more communication and co-operation may develop between our branch and Unite HQ. Stop The Genocide in Aleppo and all of Syria !